Here at Pretty Green Thinking #PGT we want brands to work with nature. I met Shaloam Hodge in person a few Fridays ago when I gravitated to her flower-bedecked Shaloah stall at the refurbished Open Market in London Road. I have now used three of her lovely handmade, locally-formulated products. Everything is packaged in recyclable material (coloured glass and a natural cotton bag) to reduce environmental impact. The finest natural plant oils are perfectly blended to improve skin texture and invigorate your mood. I particularly like the beautiful fragrance combinations; derived from purely natural essential oils and nothing else. No harsh preservatives are used, just colloidal silver to heal and support the skin. It is particularly good for psoriasis and problem skins which really inspired Shaloam when she first helped her son Leon through a severe case of baby eczema. (Her natural eczema cream is £8.95 for 60ml by the way). I started with a face cream. 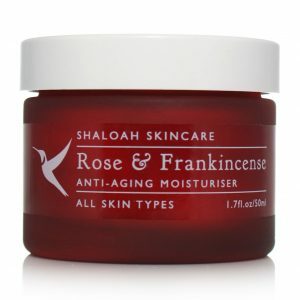 The rose and frankincense anti-ageing moisturiser comes in a red jar to regenerate and nourish. It goes on like a reassuringly thick cold cream which conditions as it soaks in. I really love the smell from organic sunflower seed oil, avocado and organic coconut oil, radish root (a new one on me), plus apricot kernel oil, evening primrose oil, argan, elderberry fruit extract, Vitamin E oil, frankincense oil, rose oil and silver micro particles -£16.95 for 50ml. 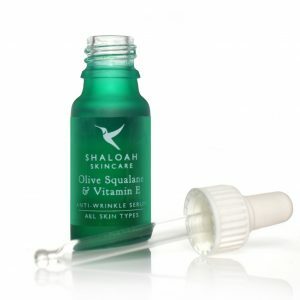 The Shaloah Olive Squalane and Vitamin E Anti-Wrinkle Serum is refreshing and clean smelling. It absorbs deep into the skin for ‘a natural facelift’ to promote cell regeneration. Each ingredient is delicious, and the little green bottle lasts for ages. Even if you have never used a facial oil before, I’d say give this a try at £12.95 for 15ml. The final fragrance was my favourite; Orange, Ylang Ylang and Cedarwood Bath & Body Oil is a luxurious pamper to moisturise the whole body. Try it neat or add droplets to the bath for a gorgeous steamy vapour that includes notes of geranium and vanilla – £12.95. 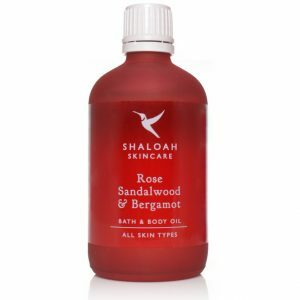 Shaloah Skincare donate 20p to the Woodland Trust plant a tree campaign for every product sold (equal to a whole tree per fifteen units). 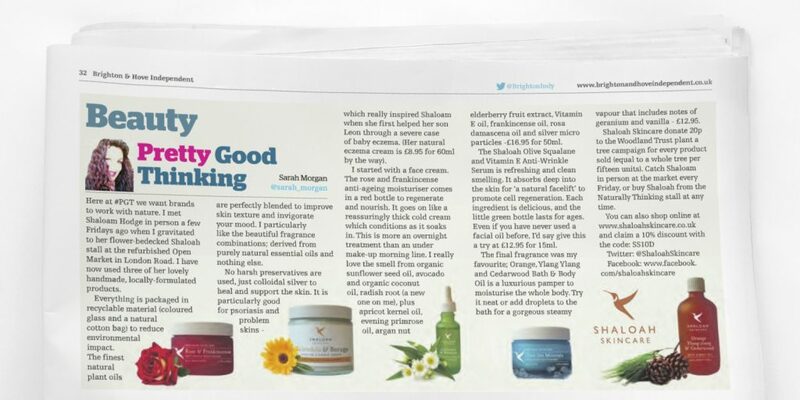 This article was written by Sarah Morgan and published in Brighton & Hove Independent Newspaper.